Mount Kanchenjunga at 8586m is the third highest peak in the world and the second highest peak in Nepal. Kanchenjunga (8586m) range in the extreme north-west of Nepal is aligned north to south along the Nepal-Sikkim border. Kangchenjunga was first climbed on 25 May 1955 by Joe Brown and George Band, who were part of a British expedition. They stopped short of the summit as per the promise given to the Chogyal that the top of the mountain would remain inviolate. Every climber or climbing group that has reached the summit has followed this tradition. Other members of this expedition included John Angelo Jackson and Tom Mackinon. 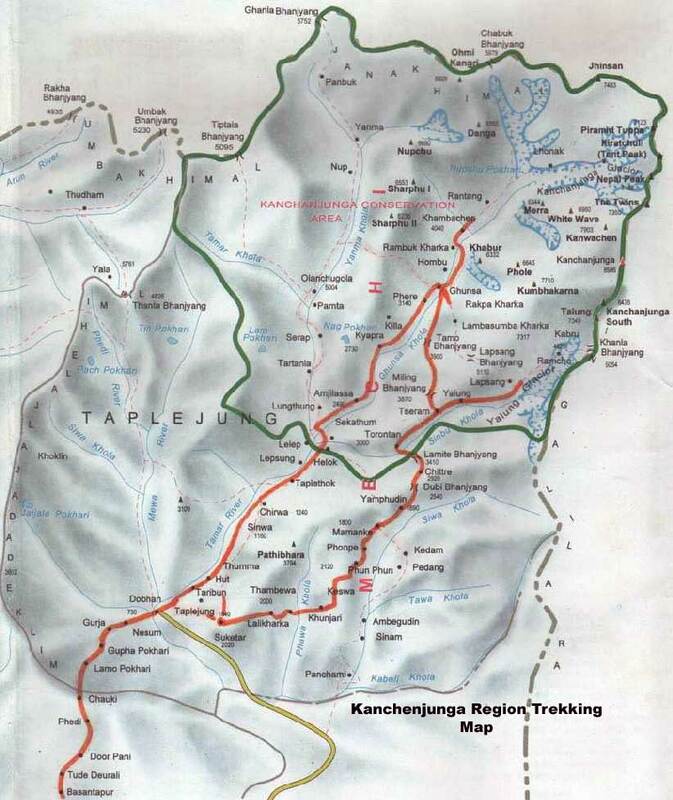 Trekking route of Kanchenjunga is drained by Tamur River that meets Arun below Mulghat. The river is fed by numerous glaciers. The glaciers north of the main peak are clockwise Nupchu, Lhonak, Chichima, Gimsung, Pyramid, Kanchenjunga and Ramtang. West and south of the main peak are Kumbhakarna (Jannu), Yamatari and Yalung glaciers. The Kanchenjunga area has a profusion of high summits of which three are above 8,000m. & 11 above 7,000m. Walking Per Day trekking: - Approximately 5-6 hours. Accommodation: - Hotel/Lodge and Camping. Grade: - Hard - Mountaineering. Best Season: - March to May is best season. Day 01: Arrival in Katmandu and transfer to hotel. Day 02- 03: Climbing Preparation days in Kathmandu. Day 04: Fly to Suketar - Taplejung and stay overnight hotel. Day 05: Trek from Suketar - LaliKhark, stay overnight lodge. Day 06: Trek from LaliKharka -Khewan, stay overnight lodge. Day 07: Trek from Khewan - Yamphudin, stay overnight lodge. Day 08: From Yamphudin - AmjeKhola, stay overnight lodge. Day 09: Trek from AmjeKhola-Torontan, stay overnight lodge. Day 10: Trek from Torontan to Tseram, stay overnight lodge. Day 11: Trek from Tseram to Ramje, stay overnight lodge. Day 12: Ramje- acclimatization/hiking, stay overnight lodge. Day 13: Ramje - Kanchunjunga glacier, overnight camping . Day 14: Glacier Camp -Kanchanjunga base camp, overngiht camp. Day 15 to Day 45: Climbing period Mt. Kanchanjunga, overngiht camp. Day 46: Trek from base camp to Ramje, stay overnight lodge. Day 47: Trek from Ramje to Amje Khole, stay overnight lodge. Day 48 : Trek from Amije to Yamphudin, stay overnight lodge. Day 49: Trek Yamphuding - Khewang, stay overnight lodge. Day 50: Trek from Khewang-LaliKharka, stay overnight lodge. Day 51: Trek LaliKharka to Suketar, stay overnight lodge. Day 52: Fly to Suketar to Kathmandu-stay overnight in hotel. Day 54 : Transfer hotel -airport for final departure. Kathmandu to Taplejung/ Kathmandu domestic air ticket for members/ cargo fees. Kathmandu to Taplejung/ Kathmandu domestic air ticket for Liaison Officer. Oxygen bottles (4 bottles per member) mask and regulator. Hotel accommodation beyond 3 nights (as per itinerary) stay in Kathmandu.